This website provides access to current and historical weather data from Washington State University’s automated weather station network along with a range of models and decision aids. The weather data, advisories, weather data products and decision support systems provided by AgWeatherNet and WSU can help improve production and product quality, optimize resource use and reduce environmental impact. 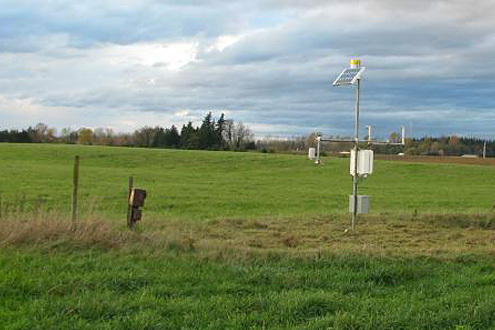 There are four automated weather stations located in Whatcom County (Lawrence, Lynden, Nooksack, and Ten Mile). Standard AWN weather variables include air temperature, relative humidity, dew point temperature, soil temperature at 8 inches, rainfall, wind speed, wind direction, solar radiation and leaf wetness. These variables are recorded every 5 seconds and summarized every 15 minutes by a data logger. This mobile site will allow you to access weather data from your mobile phone; including evapotranspiration, current conditions, yesterday’s data, and much more. This document contains a monthly summary of weather data collected at the four Whatcom County AgWeatherNet stations. If farming & agriculture are part of your life, Rufus’ forecasts are especially for you. Focusing primarily on the Pacific Northwest, the WxCafé’s™ acclaimed and uniquely informative long-range forecasts go well with your morning beverage every Monday and Friday. This website provides uniquely informative long-range forecasts for specific patrons in the PNW.